Xiaomi's 13-inch Mi Notebook Air has been updated for 2017 with an Nvidia GeForce MX150 GPU, Kaby Lake i5-7200U CPU, and fingerprint scanner. 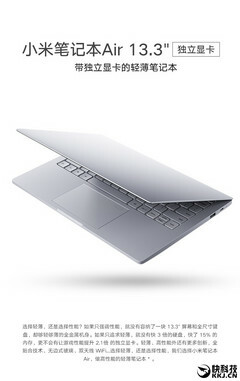 Xiaomi surprised a lot of people when they released their 11 and 13-inch pair of notebooks in July of last year. They were noted for solid construction and design at a competitive price, though were not very popular internationally due to mostly being a domestic Chinese launch. Still, what was a very solid product has been updated to make it even better: a Kaby Lake i5-7200U CPU should yield better performance and battery life, the GeForce MX150 should mean less heat and better 3d performance, and the fingerprint scanner will make security a bit more convenient. Nvidia touts the MX150 as one of its most power-efficient GPUs ever, with up to three times the performance per watt of the 940MX. This does not translate to performance, however: the MX150 will only yield about a 33% performance increase. Still, it should do so with significantly less heat output, given the smaller 16nm (vs 28nm) manufacturing process. While the original Mi Notebooks sold for around US$550 and US$750 for the 11 and 13-inch respectively inside China, getting them through exporters meant higher prices and no tech support. The same situation will likely apply to these updated models.